Franz West’s Les Pommes d’Adam – a monumental outdoor sculptural ensemble on extended loan from the Hall Art Foundation – opens on the MASS MoCA campus, in its first presentation in the United States and its second-ever showing. 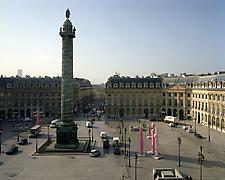 The sculpture was previously exhibited in 2007, when it was installed at the Place Vendôme in Paris next to Napoléon Bonaparte’s Vendôme Column. Les Pommes d’Adam will be exhibited adjacent to the Hall Art Foundation’s 10,000 square-foot building dedicated to the work of Anselm Kiefer, whose spring reopening – also on May 3 – marks that installation’s first full season on view at the museum. Franz West (1947–2012) was born in Vienna, Austria, where he studied at the Academy of Applied Arts (1977–1982) under Bruno Gironcoli. His work has been exhibited internationally, including at the Venice Biennale; documenta; Lincoln Center, New York; Centre Pompidou, Paris; the Hirshhorn Museum, Washington D.C.; and the Los Angeles County Museum of Art, and can be found in public and private collections worldwide. West collaborated with many other artists throughout his career, including Michelangelo Pistoletto and Mike Kelly. A related exhibition of work by Franz West from the Hall Collection will be displayed at the nearby Williams College Museum of Art from June 7, 2014 to January 25, 2015.